Below you can view all the homes for sale in the Historic District subdivision located in Monroe North Carolina. 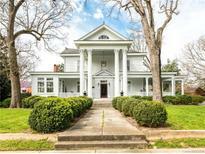 Listings in Historic District are updated daily from data we receive from the Charlotte multiple listing service. To learn more about any of these homes or to receive custom notifications when a new property is listed for sale in Historic District, give us a call at 704 604 8836. *MATTERPORT 3D tour & attached Feature List* MLS#3488142. Keller Williams Ballantyne Area. Living room w fireplace adjoins year round sunroom. MLS#3490749. J Kerr and Co LLC. Magazine worthy renovation- bring your clients that want the charm and style of the early 20th century with updated kitchen/bath and mechanicals Freshly painted Craftsman cottage with architectural shingle roof, wide welcoming full width front porch, 9 ft clgs, gleaming oak and pine floors, large Living Room and Dinning Room- both w fireplace, breakfast room w built ins, Kitchen w glass fronted older cabinetry, walk in pantry and butcher block island- rear porch overlooks fenced garden and patio- 2 or 3 beds, 1 and 1/2 baths- picture perfect in every way MLS#3488377. J Kerr and Co LLC. All appliances (fridge, microwave, dishwasher, oven, washer and dryer) convey! MLS#3481870. MATHERS REALTY.COM. Interiors offer 9 ft ceilings, oak and pine floors, newly opened floorplan with master suite on main, chefs kitchen/Living Room and Dinning Room all flow with sympathetically installed cased openings, great friends entry w drop zone and generous laundry, upper level w 3 large bedrooms and 2nd full bath- open railed staircase is a charmer MLS#3479619. J Kerr and Co LLC. The jewel of the home is the Private Courtyard with brick paver patio and Massive Brick Fireplace. MLS#3473216. Keller Williams Union County. Fully livable as is and priced below tax value to allow for a new owner to update Kitchen and baths to their taste. Take the tour MLS#3455605. J Kerr and Co LLC. Consists of two parcels, 09-231-125;09-231-125-A MLS#3440600. Century 21 Providence.